Just minutes from the beach, the Coriva Beach Hotel is found in Koutsounari, a short drive from Ierapetra. 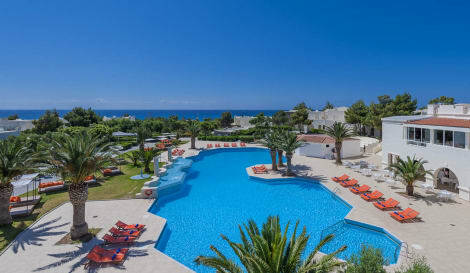 Enjoy a dip with a sea view in the pool, relax in the hotel’s gardens and enjoy fine cuisine – including local favourites – in the on-site restaurants. The hotel’s contemporary rooms are air conditioned and have safes, private balconies and free wi-fi access. Located right by its private sandy beach, Giannoulis – Almyra Hotel & Village features a freshwater pool with sun-lounger terrace. Bar service is available next to the pool and on the beach. All rooms are spacious with traditional decor, and they have views of the garden or the sea. Each is air conditioned and comes with a satellite TV and bathroom with tub and hairdryer. There is a children’s section in the main pool, and a playground is available in the hotel’s well kept garden. The Almyra’s animation team will keep young guests entertained. The hotel restaurant serves breakfast, lunch and dinner with a focus on Cretan, Asian and Mediterranean cuisine. Cocktails, snacks and a variety of refreshments are available throughout the day at the pool bar and beach bar. With free on-site parking, Almyra Hotel is 9 km from Ierapetra, and 100 km from Heraklion Airport. The centre of Koutsounari is 400 m away, and features local taverns and cafes. lastminute.com has a fantastic range of hotels in Koutsounari, with everything from cheap hotels to luxurious five star accommodation available. We like to live up to our last minute name so remember you can book any one of our excellent Koutsounari hotels up until midnight and stay the same night.